Publisher Konami acknowledges issues facing the launch of their recent survival action game Metal Gear Survive, offers compensation to players. 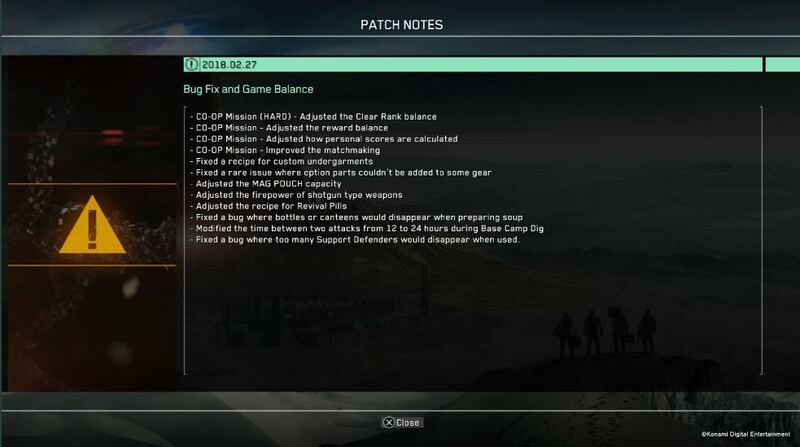 Bug fixes and game balance also being fixed. It's been a rough launch for Metal Gear Survive which has experienced some technical issues and server problems recently, but Konami are compensation players hit by problems by giving out rewards to those affected. Players who have logged in to the game by February 27th will find a free premium booster and 100 SV coins waiting for them when they login. While you cannot use the coins for buying a new game, it will at least let you purchase boosters for Metal Gear Survive to help stay alive in the zombie invested world. Additionally, a brand new update has also hit Metal Gear Survive that will squash a number of bugs, as well as balancing some gameplay mechanics to make the game better. In a recent Tweet Konami lists some of the changes they are making to the game, which also moves equipped ammo to the storehouse. You can also get a look at the patch notes included in the screenshot.